Saree, the beautiful apparel, hides all the bad aspects and throws up the good aspects of a woman’s figure, and changes a hulky-bulky woman into a presentable lady. A young girl with a good figure looks petite in a saree. 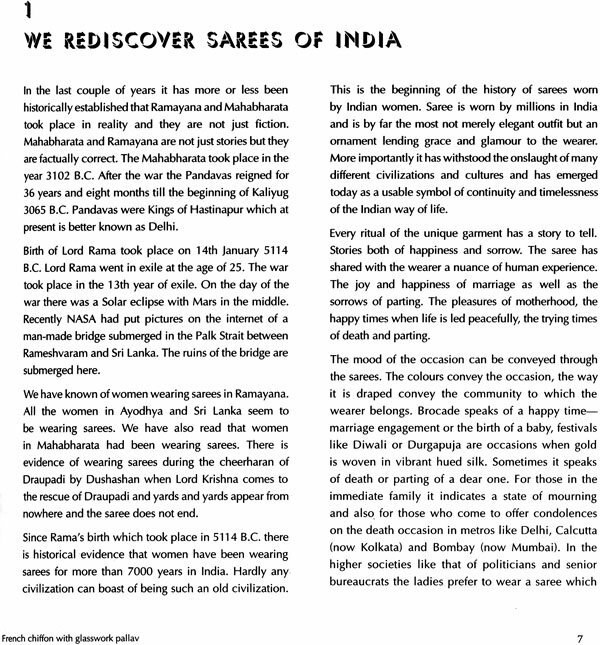 Women have been wearing sarees from the days of Mahabharata an Ramayana. There is a reference of Draupadi’s cheerharan in Mahabharata when Lord Krishna comes to her rescue. 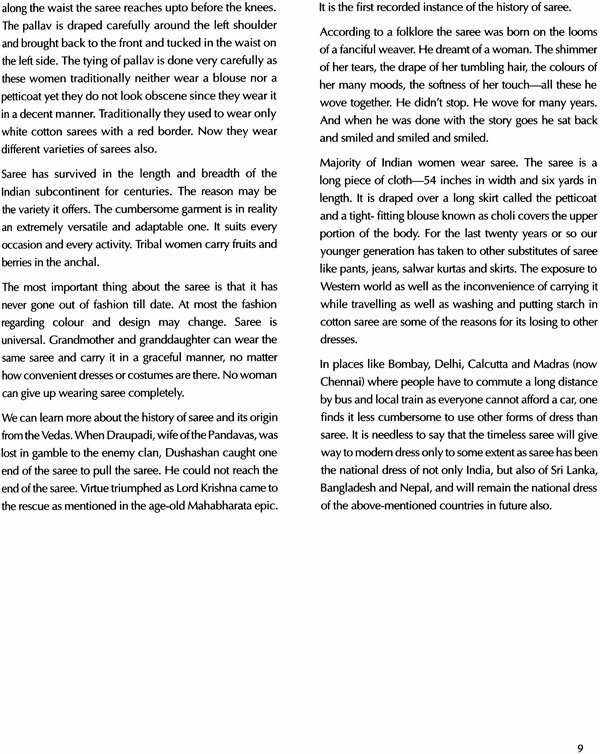 We also know through our scriptures that Sita and other women including those who lived in Sri Lanka wore sarees. 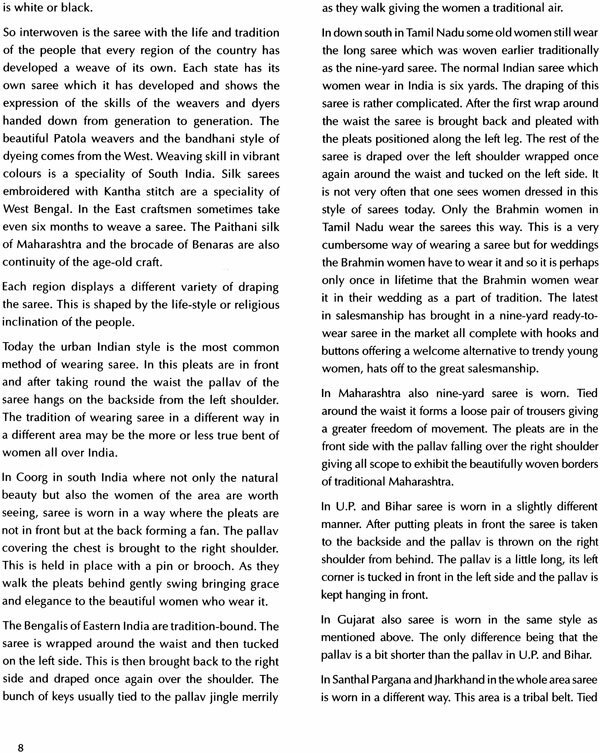 It is the national dress for ladies in India, Sri Lanka, Bangladesh and Nepal. Of late, some foreigners want to wear sarees for dinner parties in some countries, specially in South East Asia. Recently saree has become very popular with the NRI women. This was not so some years back. Womenfolk in Delhi tell us that they buy some of the most expensive sarees since they are not only fond of them but can also afford them. 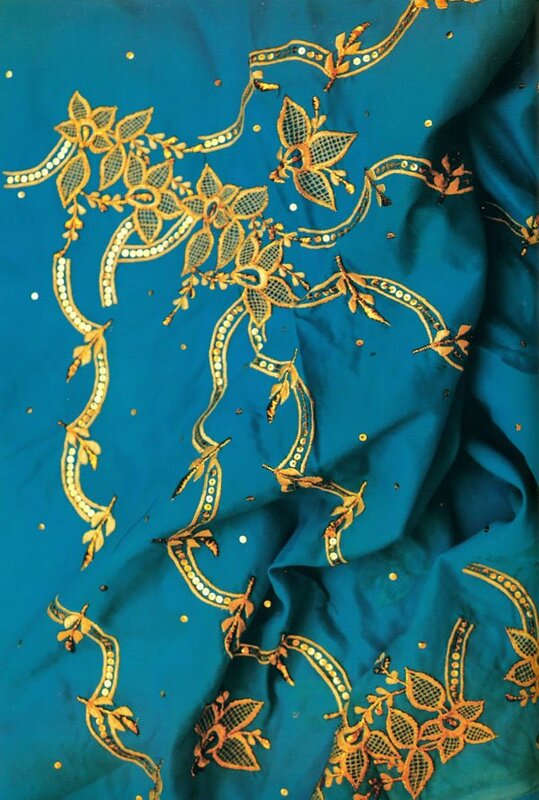 The book covers almost all the varieties of sarees made in India including the Dhaka ka malmlal of Bangladesh. 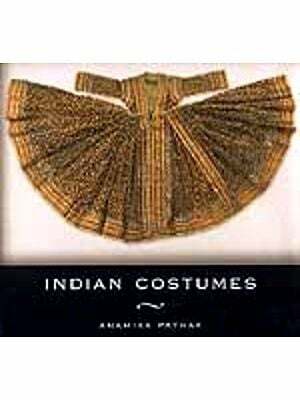 It has separate chapters covering Benaras silk sarees, Odisha silk and cotton sarees, Phulkari of the Punjab, Sequins work , Kalamkari and Dharmawaram silk sarees from Andhra Pradesh. 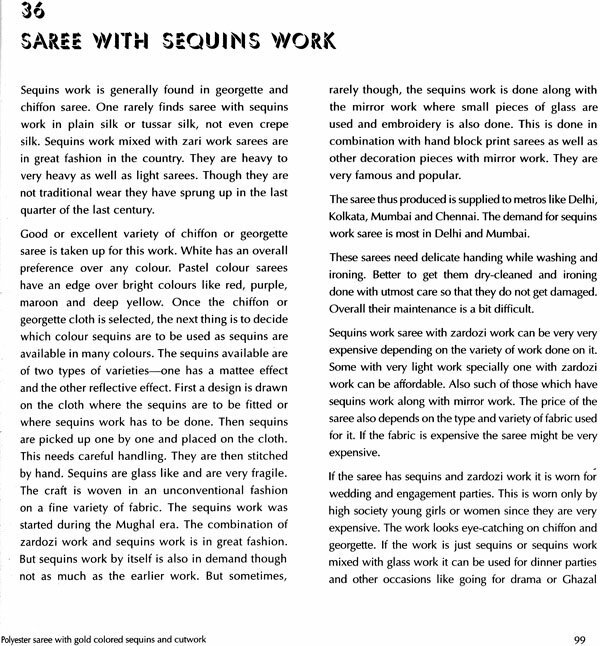 Every chapter deals with either one or sometimes two varieties of sarees. 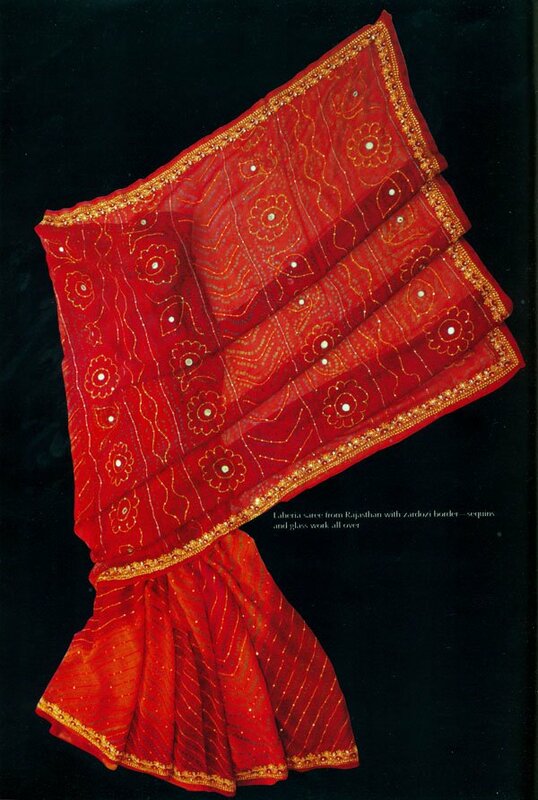 The book has excellent colour photographs to go with each saree. 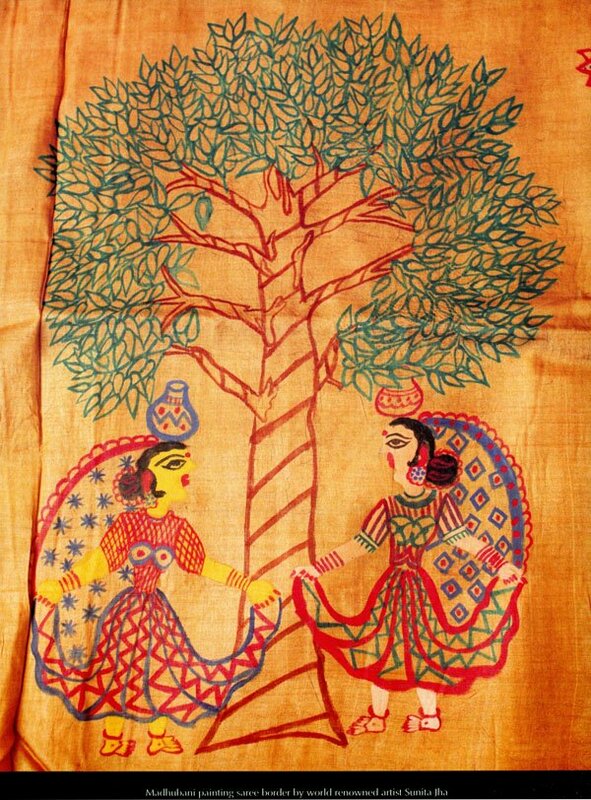 There is a photograph of a golden yellow tussar silk sarree painted by the internationally acclaimed Madhubani painter Sunita Jha. 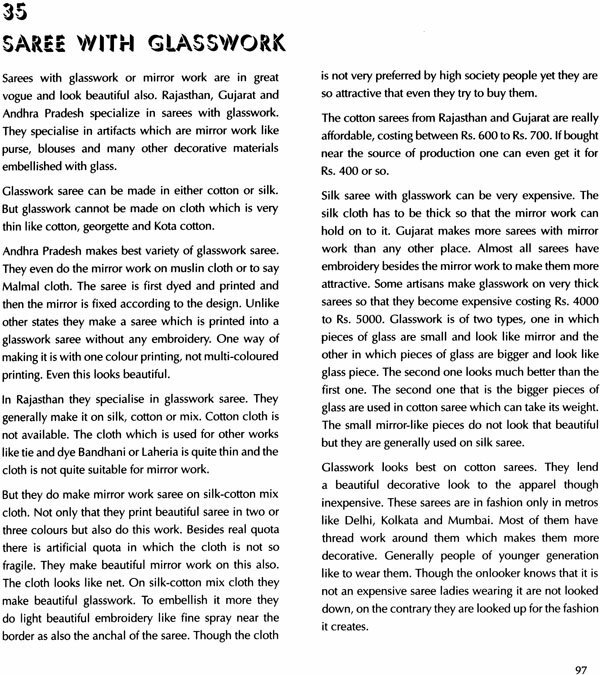 Most of the traditional sarees have been covered. 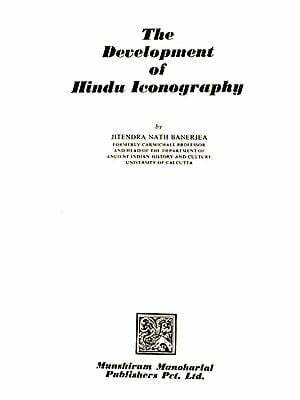 All the sarees displayed belong to the author of the book. Nishi Sinha born on 10th Feb. 1945, has written five books: Gardening in India published by Abhinav Publications, water Resource Management published by Har Anand Publications, Industrial Scenario in India published by Ashish Publications, and two more books were published by Ashish- Tourism Perspective in Bihar and Bureaucrats Life-a phantasy. All her five books figure in Wikipedia and sell well all over the world. A journalist by profession, she left the press at the end of nineties and switched over to book writing. She specialized on economic issues and water resource management. Her articles on theabove two issues were published in Economic Times, Financial Express, Business and Political Observer and Yojana published by the Planning Commission. She was a columnist on gardening during the end of eighties in National Herald for two and-a-half. She has learnt music from Ustad Ishtiaq Hussain Khan of Rampur Gharana. She looked after the art and culture section for two years in the Sunday Supplement of Economic Times from patna during early eighties. From mid seventies, she started contributing issues to newspaper like Amrit Bazar Patrika, She derives pleasure in writing.